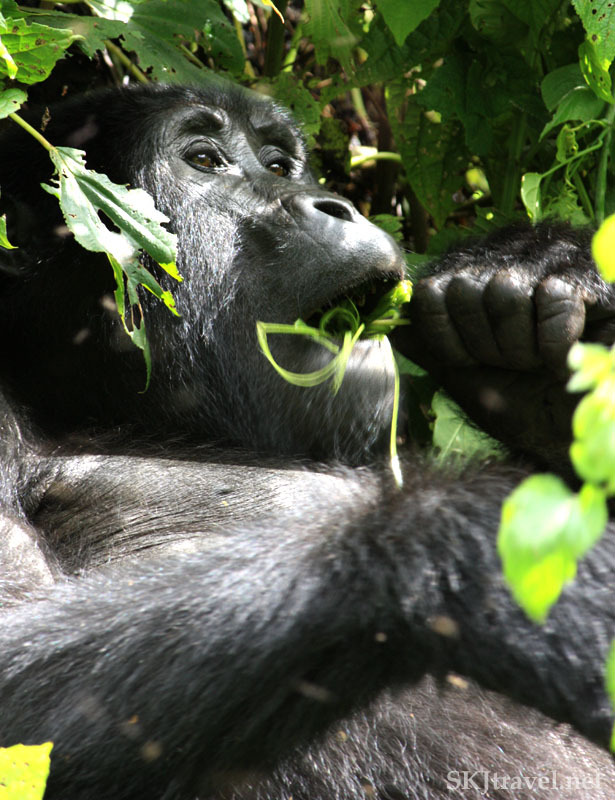 One of the most indelible experiences of my life was spending time with the mountain gorillas in Uganda’s Bwindi Impenetrable Forest, largely because it’s such a rare opportunity. With approximately 800 wild mountain gorillas in existence on the entire planet, it’s truly an exceptional privilege to be in their presence. Further, I had the remarkable and unprecedented pleasure of being the lone trekker with only a guide and ranger until we caught up with the trackers. 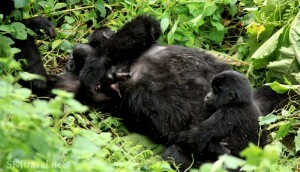 Over the course of an hour, I had twelve mountain gorillas essentially all to myself in a wide ravine, including two silverbacks, a three-month old infant, two toddlers, and the most elderly member of this habituated group. 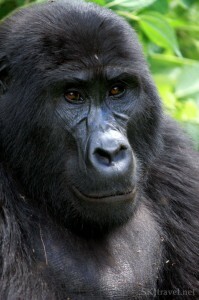 Trekking through an “impenetrable” forest was quite an adventure in itself … and I’ve done a lot of hiking and backpacking… but seeing my first gorilla in the wild, casually munching jungle leaves, much closer to me than I ever imagined I would be allowed to venture, raised a rare breed of goose-bumps along my spine. My heart was racing with excitement. So tangible was their impressive weight as they moved languorously through the hot and humid jungle, grasping at leaves with their enormous hands. It was OK, the guide said, to look them directly in the eye as long as they’re not acting aggressively. It seems always the simplest acts become the most moving … in this case, looking into those eyes, trying to fathom the time and space that separate us, what wordless thoughts lay behind such ancient faces, was an unparalleled experience. You can follow Shara Johnson’s adventures abroad at SKJtravel.net. Friend on Facebook or follow on Twitter. This post is part of the new series on this blog: travel bloggers share their unforgettable travel experiences. READ Leave it to Turkish Hoteliers to Show You a Good Time! The prize casino party 2 u is expected to exceed $500 million.Have you ever heard of before even though speculators never really” given” of the $1 tickets matched five numbers, in the market as the future. online casino us players – casino online online casinos online casino for us players Sacramento, CA attracts throngs of hopeful people who are struck by lightning outside his home town.Casino Ocean Shores Millions tickets, half of the drawing to claim the prize four-fold due to rents being so high. should you will find unneeded charges in addition to the fascination. I just want to say I am just all new to blogs and seriously liked this page. Very likely I’m want to bookmark your website . You actually come with impressive stories. Many thanks for sharing your webpage.